All compositions by Ted Piltzecker. Lyrics by Langston Hughes # 8. His transformation to full-time vibes player came after a tour with The George Shearing Quintet. “I used to bring the trumpet with me when I was touring in Shearing’s band,” he recalls, “and I’d practice in the back of the bus with a whisper mute. I was never interested in being a screamer lead trumpet guy, and admired players like Art Farmer and Clark Terry. But at one point I realized that I was done with it. So when I got off one of the Shearing tours, I put the trumpet in the case, closed it, and it was out of the house the next day. I never touched it again. 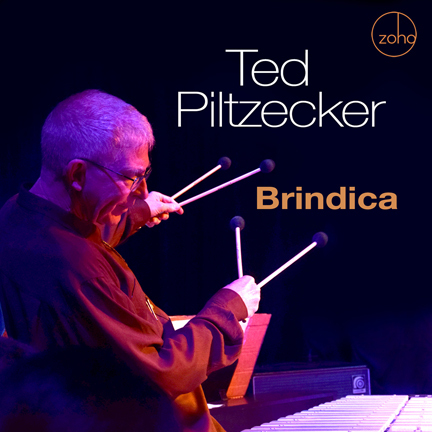 As a born-again vibraphonist, Ted has performed with many of the great names in jazz, including guitarists Gene Bertoncini and Vic Juris, bassists Rufus Reid and Andy Simpkins, drummers Lewis Nash, Dennis Mackrel and Clarence Penn, pianists Jim McNeeley, John Hicks and Bill Charlap, and saxophonists Chris Potter and Javon Jackson. In his previous four albums as a leader, Piltzecker hinted at his broad range of interests, from jazz standards to tangos to African-flavored numbers. On Brindica, his fifth outing overall and debut for ZOHO Music, the vibraphonist/composer/bandleader takes listeners on a worldwide musical journey. The title Brindica reflects cultural influences from Brazil, India, and Africa but there are also stops in Bali, Cuba, Puerto Rico, New Orleans and Harlem. The diverse musical landscapes, people and traditions that Piltzecker encountered in his travels are woven into the tapestry of this very engaging album. Recorded in Argentina with a core group of drummer and co-producer Fernando Martinez, pianist Miguel Marengo, bassist Mauricio Dawid and alto saxophonist Carlos Michelini, Brindica also features guest appearances by trumpeter Jon Faddis, baritone sax player Gary Smulyan, tenor saxophonist Ralph Lalama, trombonist Matt Hall and steel pan/snare drummer John Wooton. Classical clarinetist Ayako Oshima and classical flutist Tara Helen O’Conner appear on two tracks. And from Cuba, Jansel Torres adds an authentic flavor with his bata and conga playing on Por Supuesto while djembe drummer Dave Lewitt and percussionist Angel Lau enliven the 6/8 African factor on “From the Center.” Up-and-coming vocalist Taylor Burgess turns in a haunting interpretation of Langston Hughes’ poem What Happens to a Dream Deferred? with appropriately noirish backing from Piltzecker and his empathetic crew. The Latin flavored Feliz Paseo, fueled by a clave groove and Marengo’s hypnotic son montuno piano playing, features strong solo contributions from altoist Carlos Michelini. The ensemble switches gears on the title track Brindica, a through-composed piece that showcases the precision playing of internationally-renowned clarinetist Ayako Oshima and flutist Tara Halen O’Conner, a two-time Grammy nominee. Piltzecker blends rhythmic elements of Brazilian and African music here while also introducing Xhosa click singing, popularized in the 1960s by South African singer Miriam Makeba. “I remember listening to her singing ‘Nongqongqo’ with Harry Belafonte’s famous live album (1960’s Returns To Carnegie Hall),” he recalls. “That’s a record I heard as a kid and just never forgot.” The leader also injects some South Indian Carnatic singing (or konokol) near the end of this exotic number. Tara returns to play alto flute on the Balinese gamelan-flavored Ogoh, Ogoh, a song inspired by a tradition in Bali where every year on the eve of Nyepi (day of silence) huge, menacing demon-like creatures are hoisted on platforms and carried through town in a parade. Then they are burned to insure a tranquil and loving existence for the coming year. 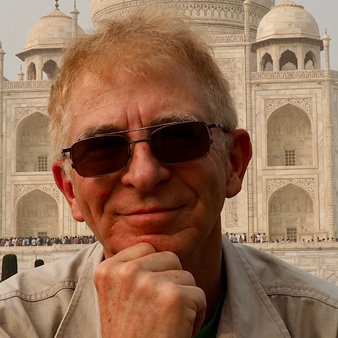 “The music shows the peaceful Balinese spirit, goes briefly to a flourish, and then returns to a calm place,” says Ted. The driving From The Center is divided into three segments  a lively cut time section, a growling 5/4 middle section, and a hammering 6/8 section  and draws on tonalities, spirit and an undulating rhythm from Ghana. The album closes with a brief reprise of “Uncle Peck” to give listeners a little lagniappe. Produced by: Ted Piltzecker, Fernando Martinez. Recorded at Sound Rec and Estudio MOMA, Buenos Aires, Argentina, and at Purchase College Conservatory of Music in New York, in 2018. Recording engineers: Ricardo Sanz, Fernando Martinez. Assistant engineers: Adam Pietrykowski, Laura de Rover. Cover photo: Anisha Maharjan. Other Photography: Caj Thomasson, Valeria Marchese, Karen Arango. Art direction and package design: Al Gold. Executive Producer: Joachim “Jochen” Becker. Publisher  all compositions: Corner Mushroom Music, ASCAP  all rights reserved. Lyrics for #8: ©1994 by The Estate of Langston Hughes, by permission of Harold Ober Associates Inc.
My heartfelt thanks to the remarkable group of musicians who performed, to my family, to Fernando Martinez, to John Stevens, Oscar Albrieu Roca, Lorena Peralta, Daniel E. Harrison, Dawn Gibson, Janis Astor, Al Pryor, and to all contributors without whom this album would not be possible.